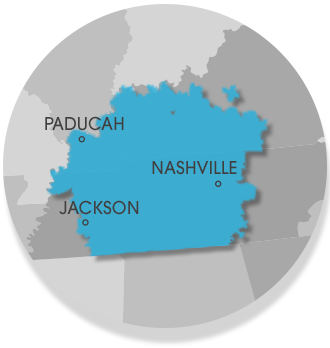 We serve Nashville, Clarksville, Jackson, Murfreesboro, Owensboro, Philpot, Bowling Green, Fayetteville, Marion, Utica, Leitchfield, Franklin, Mcminnville, Paducah, Shelbyville, Hartford, Antioch and many nearby areas in Tennessee and Kentucky. At Frontier Basement Systems, we take pride in leaving your home looking clean and neat. Once the installation is completed, we repair all cored holes with concrete, making your final installation virtually invisible. A concrete slab being jackhammered and removed during a floor replacement in Hopkinsville. A typical replacement can take several weeks to complete. Looking For Foundation Slab Repair Contractors In TN and KY? At Frontier Basement Systems, we provide proven solutions for concrete slab floor leveling -- as well as other foundation repair solutions -- to homeowners throughout Tennessee and Kentucky. We provide each of our customers with a free, no obligation slab repair quote, in writing, before any work is done. To schedule your appointment, call or e-mail us today!